What could be better than a warm cinnamon roll topped with a white chocolate glaze? 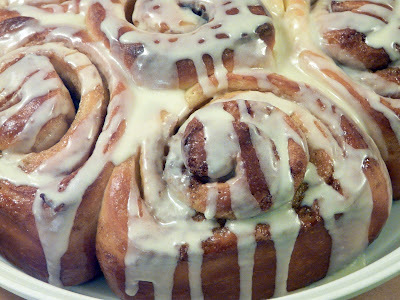 I decided last night around 7:00 that it would be a good idea to knead up a batch of dough for cinnamon buns. A couple of hours later the buns were shaped and in the fridge for an over night rise. Moe was up early so he turned on the oven and took the rolls out of the fridge. Forty five minutes later they were in the oven and by 6:30 AM we were enjoying our first coffee and a warm gooey cinnamon bun. My favourite Cinnamon Buns are from Grounds for Coffee in Vancouver. The recipe from Joy of Baking is the next best thing. Normally I would top these with a cream cheese icing but I was out of cream cheese so White Chocolate was the second choice. TIP: Heat about 1/4 cup cream, add two to three ounces of quality white chocolate (I use Callebaut)(sorry, I don't measure) stir until chocolate is smooth. Add enough icing sugar (powdered sugar) to make a glaze. 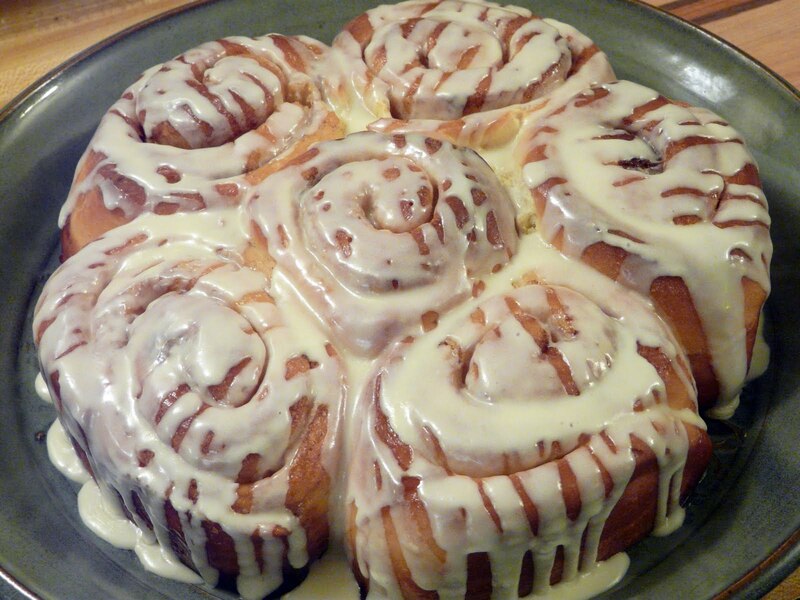 In a bowl stir together 1 1/4 cups sifted powdered sugar, 1 teaspoon light corn syrup, 1/2 teaspoon pure vanilla extract and enough half-and-half (1 to 2 tablespoons) to make the glaze thin enough to drizzle over cinnamon rolls. In a large mixing bowl combine 2 1/4 cups of the flour and the yeast. In a small saucepan heat the milk, the 1/3 cup butter, 1/3 cup sugar, and salt just till warm (120 degrees to 130 degrees)and butter is almost melted, stirring constantly. Add to flour mixture. Add eggs. Beat on low speed for 30 seconds, scraping sides of bowl. Beat on high speed for 3 minutes. Using a wooden spoon, stir in as much of the remaining 2 1/4 to 2 3/4 cups flour as you can. Turn dough out onto a lightly floured surface. Knead in enough of the remaining flour to make a moderately soft dough that is smooth and elastic (3 to 5 minutes). Shape into a ball. Place in a greased bowl, turning once. Cover; let rise in a warm place till double (about 1 - 1 1/2 hours). For filling, combine brown sugar, the 1/4 cup flour, and cinnamon. Cut in remaining butter with a pastry blender until mixture is crumbly. Set aside. Punch dough down. Turn onto a lightly floured surface. Cover and let rest for 10 minutes. Roll the dough into a 12 inch square. Sprinkle filling over dough square; top with raisins (if desired). Roll up jelly-roll style; pinch edges to seal. Slice roll into eight 1 1/2 inch pieces. Arrange dough pieces, cut side up, in a greased 12 x 9 x 2 inch baking pan. Cover dough loosely with clear plastic wrap, leaving room for rolls to rise. Refrigerate dough for 2 to 24 hours. Uncover and let stand at room temperature for 30 minutes. Brush dough with a half-and-half. Bake in a 375 degree oven to 25 to 30 minutes or till light brown. invert again onto a plate. 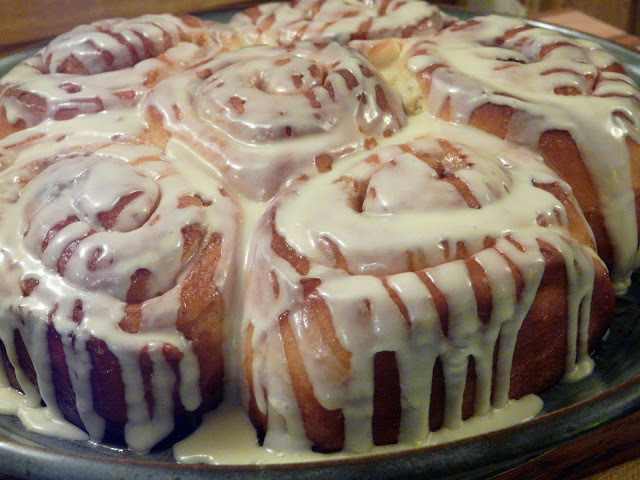 Can drizzle with Powdered Sugar Glaze. Serve warm. Makes 8 rolls. Yum! They look so inviting and delicious! They are picture perfect.I love the idea of white chocolate. Gorgeous, I don't mind a bun right now.. I think I died and went to heaven. This is awesome. Served up with a great cup of coffee and my morning or afternoon would be perfect. Thanks for sharing. hmmmm...maybe for Easter Sunday I will make them! They really were good. Made two pans and gave one away. Moe and I had the two remaining rolls warmed up this morning for breakfast. Ann, I made these this morning. Outstanding but huge rolls! I should have covered a little sooner with the foil. You surely got two pans of rolls from the recipe. If I had done the 8 they would have been 2+ inches wide. I love the fine texture and the deep yellow from the eggs. You are very welcome Gld. Thanks for the feed back. Much appreciated. I've made this recipe in the past and cut 8 rolls as the recipe specifies. And the rolls are huge. 12 divided into two pans is perfect. wow i've never thought to top cinnamon buns w WHITE chocolate before! awesome idea. I must check out that coffee shop too. Do you have the nutritional information on these delicious rolls? Calories and fat grams is what I am looking for. wow, looks delcious.... iw ill try to do it today. hope it will work. i like the idea of making it by my self , i will give it a try,,,,,, hope my kids will eat it lol.